A compilation of some of my running, hiking and climbing adventures. This is one of my favorite half-marathons. Held on the first Sunday in April every year it benefits a great organization, Albertina Kerr, that works with children and adults with developmental disabilities. A couple of the things that make this race really great. Indoor location pre- and post-race. Most races have you shivering outside in the street somewhere, relying on porta-potties, etc... This race starts and ends just outside the Oregon Convention Center. They rent out one of the large exhibit halls for the race so everything pre-race is indoors - baggage check, regular bathrooms, AND there is even a large stretching area. It is great to just be able to hang out in the warmth pre-race. Good organization from beginning to end. A decent size - not too big and not too small (about 1800 in the half-marathon). You definitely get the feel that you are racing but you aren't surrounded by so many people that you are just people dodging for miles. A good course. The first 4 miles involve a steady uphill that makes the first half of the race slower than the second. Definitely a race you can negative split (running faster as you get farther along in the race than when you start). After those first 4 miles you get a nice gradual downhill for about 2 miles that really allows you to pick up some speed. Then you are on to the flats for almost the rest of the race. The one caveat to that is you hit a nice 80 foot ramp that you need to climb at 12.4. This is hard because you are trying to "kick" and finish strong but that hills does take its toll. My goal this year was to beat my time from last year which was my current PR (personal record) of 1:46:57, and to hopefully finish in 1:42. I knew that I couldn't start off to conservatively and still beat that time, so I planned to go out around 8:10 - 8:20 and then try to drop to 7:45 ish. I rode my bike to the Convention Center, leaving the house around 5:40 AM. It was dry for a change and not overly cold (around 39 degrees). The streets were very quiet and it was an enjoyable ride. Was at the convention center by 6:05. Headed to the exhibit hall and sat down in the stretching area to sort my stuff and stretch out a bit. My friend Linda joined me there, and then Alice showed up, and her friend Will. We chatted for a bit, got organized, used the indoor bathrooms. Then it was time to check my bag and head for the start line. We left the cozy warmth of the convention center at 6:53 for the 7 AM start. I once again opted to go without my race belt - feeling like I really didn't need to carry my own hydration for this distance. I had done the same thing last year, however I had used some of the on course electrolyte drink, Heed, which my body wasn't used to. I made it through the race and home ok, but post-race couldn't leave the house for a bit due to digestive system rebelling against the Heed (thankfully it wasn't a marathon b/c if it had been I would have been in trouble). I felt as though I didn't really need electrolytes for this distance and opted to go with water instead at the aid stations. There were aid stations just about every 2 miles. I was carrying 2 gu's and 3 shot blocks in my skirt pockets. I had pre-planned a gu at the 4.5 and 8.5 aid station, and figured I would use the shot blocks if I got hungry. The start was a little slow as all the racers made it across the starting line. Then it was a bit of an uphill climb to the Broadway Bridge. We ran into a constriction here due to construction that slowed me down a bit more than I would have liked. Then it was down the ramp and things started to ease up a bit. I felt like I could now work to find my comfortable place. There was an aid station at mile 2, I grabbed a cup of water, drank a few sips and kept moving. This where the long uphill begins. It is only a climb of 250 and it is gradual - you gain those 250 feet over 2 miles - but you definitely feel the hill. As I approached mile 4 I grabbed my gu to warm it a bit, knowing the aid station was coming up. I downed the gu about 100 yards before the water stop, then grabbed a cup of water, got a few sips down and kept moving. This is where the nice downhill begins and I wanted to make up some time. Right around the 5 mile mark I noticed that I was consistently running next to a guy in a blue shirt and had been since just about the beginning of the race - we seemed to be running right around the same pace. I would go ahead of him, he would go ahead of me, but we never seemed to be very far a part. The downhill came and went quickly. I was keeping an eye on my splits and hoping that I would make my goal time. I got a bit frustrated as we hit the halfway point because I didn't think I was moving fast enough to hit it, but decided to just keep moving and hoping I could shave some time. Took my next gu at mile 8.5. This one had caffeine in it that I hoped might give me a bit of a boost that would kick in for the last 3 miles. There is an out and back section of about 3/4 a mile at this point. I made the turnaround at mile 9.2. Unfortunately we now had a light headwind that we would be facing for the next 3 miles until we did another turn around just after mile 12. Not long after I made the turnaround I saw Will, and then a little bit later saw Alice. They were both looking good and strong! Around mile 8 I had tucked in right next to the guy in blue that I had been traveling with the majority of the race. We were running shoulder to shoulder for about 2 miles. I figured if it annoyed him he would tell me or move over. It was kind of funny b/c we had a whole stretch of road we could be using. But being that close to somebody and moving together seemed to really work for me and keep me on pace. At one point I actually thought about talking to him and asking him if he wanted to work together on pacing, but he had his headphones on and I'm not good at talking to new people so I didn't. Another brief water stop at 10. At this point I went ahead of my guy in blue and picked up another guy in white. Did the same shoulder to shoulder technique for just about 2 miles. At the 12 mile mark I worked to kick it into high gear for the finish. 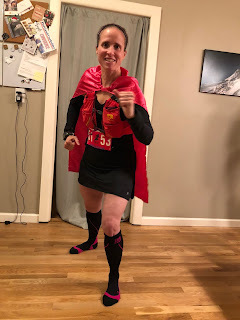 I had been worrying about my calves cramping from around mile 8 (I had started being aware of my calf muscles at that point) so had been a bit more conservative than I had wanted to be for the second half of the race. The last push up to the Steel Bridge was rough. Once I topped out I could really feel the lactic acid building up in my legs - they were feeling very heavy - but I was almost done at this point. Put on a burst of speed and crossed the finish line in 1:41:05. Grabbed a cup of water and waited for Will to cross the line. He came through about 40 seconds after me. We were standing there waiting for Alice and the guy in blue came up to me and thanked me for helping him through the race. He said running with me really helped to keep him on pace. That was really fun. Then a minute or so later the guy in white came up and said the same thing. He said he tried to stay with me at the end but couldn't quite keep up. I told them both that it helped me running with them as well. It's nice when you can work together with fellow racers - not with conversation or anything but just by trying to pace each other. It added a fun element to the race. Alice crossed the line in 1:45:30 (an 8:07 pace). Prior to the race she had said "I think I can go sub-9's." I kind of looked at her dumbly and said "yeah, you can go sub-9's" knowing full well she could do much better than that with all the training she has been doing. Overall I am pretty happy with the race. A little frustrated because I could have worked harder the last 5 miles but I was tentative because of my calves. One of these times I am just going to have to push it hard and just see what they do. Congrats on coming in under your goal pace! It sounds like it was a fun race .. neat that you could help others pace and that they could help you. For the last five summers, I have been lucky enough to get to organize a running camp on Mt. Hood. 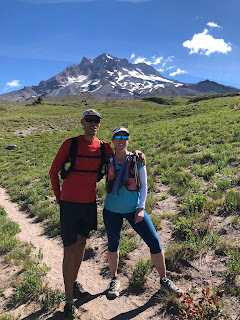 And for the last four summers, for three days I get to immerse myself in the fun and excitement of adults coming to summer camp, where they get to spend their days running on trails, learning from some awesome athletes, and enjoying the beautiful scenery. This year I had the pleasure of meeting a woman who traveled from Queens, New York for the three-day camp—flying in on Thursday evening and back home on Sunday night on a red-eye. She had googled "mountain running camp" and had stumbled across ours. She was in the midst of working on some changes in her life and when none of her friends would commit to coming with her, she decided to come out for the camp on her own. I haven't posted in awhile. I've been training, and working (a lot), and trying to get myself ready for my next 100 mile attempt. It hasn't been a great build-up period. The 10 weeks off running (6 of that non-weight bearing) between January - March seemed to take a toll. Then my back/hip issue got worse (started last September, still trying to get it worked out) and limited my ability to run and do hill training. July rolled around and I still hadn't gotten much in the way of hill work. The weeks leading up to race day were not fantastic. I had a solid long run at the end of August, and then things started to unravel. Too much work and some craziness in my personal life led to more mornings of sleeping in then getting up to run, and a lot of very late nights of work. But I did still get in some OK miles, ending with a 21 mile training run 3 weeks ago. As my good friend, who is also a running coach, tried to remind me "you can't cram for the test; best to go in undertrained that get injured ... again." I promised myself when I was out on the course, in pain, hating pretty much everything and everyone, that I wouldn't sugarcoat this race report. I wouldn't try to re-write history and make myself look stronger and better than I was out there. I would write it as it happened, with the best recollection that I could. If you are looking for a happy race report, you might as well skip this one. It is also very long. It was my first 100 and I wanted to get all of the information down, so that I can look back on it for future races.